You can purchase a license online. 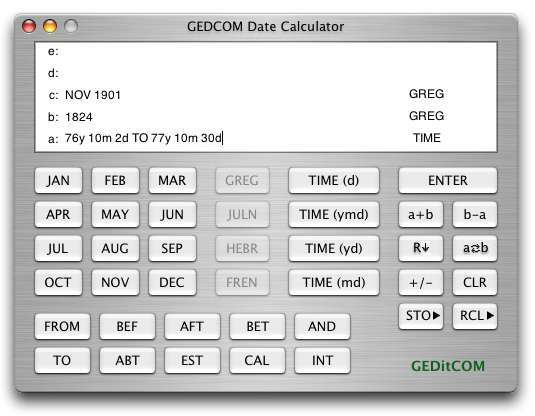 The Date Calculator is MacOS X application for many date and time calculations useful to genealogists. It is free if you are a registered user of GEDitCOM II. For others you can get it at the Mac App store or you can click Buy Now below to order here (note the App store version requires Mac with Intel chips, but the one here will work on both Intel and older G4 Macs). You can enter dates a wide variety of ways and convert the dates between four different calendars. The Date Calculator supports the Gregorian, Julian, Hebrew, and French Republic calendars. You can customize the format for display of dates. You can calculate the day of the week for any precise date. You can enter two dates and calculate the time span between those two dates. You can enter any time span and add or subtract it to or from the date. You can add or subtract time spans. Most date applications expect you to enter precise dates with a day, a month, and a year before they will do conversions or calculations. All features of the Date Calculator can be done on "fuzzy" dates. "Fuzzy" dates are dates with just a month and year or just a year. When time spans are calculated between fuzzy dates, the Date Calculator will calculate the maximum and minimum times between those dates and report it as a time range. When times or time ranges are added or subtracted to or from fuzzy dates, the Date Calculator will calculate the range of possible dates. Fuzzy date calculations are often useful to genealogists. For example, if you know someone was born in 1824 and died in NOV 1901, how old was he at death? Using the Date Calculator, you can find the time span between those dates to determine he was "BET 76y, 10m, 2d AND 77y, 10m, 30d". Thus, he was 76 or 77 years old with a greater chance of being 77. Adding or subtracting time spans to or from fuzzy dates can also be useful. For example, if you know someone died in NOV 1901 at age 77, when was she born? Using the Date Calculator, you can subtract "BET 77y AND 77y, 364d" from "NOV 1901" and find the possible birth dates as "BET 3 NOV 1823 AND 30 NOV 1824". If you later find out they were born in 1824, then the birth date is narrowed down to NOV 1824 or DEC 1824. Extensive help information with details about each of the four supported calendars is included. Click the link in the following table to download the Date Calculator. The download is a 100% functional version, but will ask for an unlocking code every time it starts. You can eliminate the message by purchasing a license and entering the code you will get. If you are a registered user of GEDitCOM II you can enter your GEDitCOM II unlocking code to eliminate the message. To pay by credit card, click the "Continue" link on the lower left of the invoice screen that appears. To pay using PayPal, use the log-in fields on the lower right. This license works for any version; get the version appropriate for your Mac from the above downloads table. Upgrading versions is free (use same license as before). After completing your purchase, you will get a confirmation email from PayPal about the charge to your credit card or PayPal account. Your permanent code will arrive by email from geditcom.com (typically in 1-3 days). If you purchase and install from the Mac App store, it will be ready to run; you won't need to enter a code. Date Calculator uses the date conversion utilities written by Scott E. Lee. He has written a Date Convertor Web Site that converts precise dates between Gregorian, Julian, and Hebrew calendars. He has also posted an excellent Calendar Overview about those calendars. Most of his overview is included (with permission) in the Date Calculator help.